"Demand for JCB telescopic handlers has been very high in recent years due to the strong construction industry and customers from evolving industries, such as the entertainment industry and energy sector, using telehandlers for new applications," said Rebecca Yates, product manager of material handling at JCB North America. "By making these new options available for our lift-and-place telehandlers, we give current and new customers the opportunity to tailor their machine for maximum productivity and safety in their particular application." Now available on JCB Loadall compact and lift-and-place telescopic handlers, JCB non-marking tires prevent unsightly black marks associated with conventional black rubber tires. The positive air shut-off (PASO) option is designed to shut the engine down if flammable materials are detected, to protect the operator and the machine. This feature is commonly requested by customers in the energy sector where telehandlers may work in proximity of natural gas, propane or other flammable materials. PASO also is relevant to mining, airport support, pipeline development, fuel handling, portable welding and oilfield maintenance applications. To further enhance the superior visibility of JCB telehandlers, extra mirrors and a rear back-up camera are available. The new mirror package includes additional mirrors for the boom nose, rear chassis and engine side, and can be retrofitted to existing machines. A rear back-up camera package includes a camera fitted into the rear chassis and an in-cab monitor and is available as a factory fit option. JCB now offers non-marking, semi-solid tires for compact and lift-and-place telehandlers, including larger machines up to 14,000 lb. lift capacity. The non-marking tires are grey in color and are significantly less likely than conventional black rubber tires to leave unsightly tire marks on prepared surfaces such as concrete, sidewalks, patios and hardscapes. 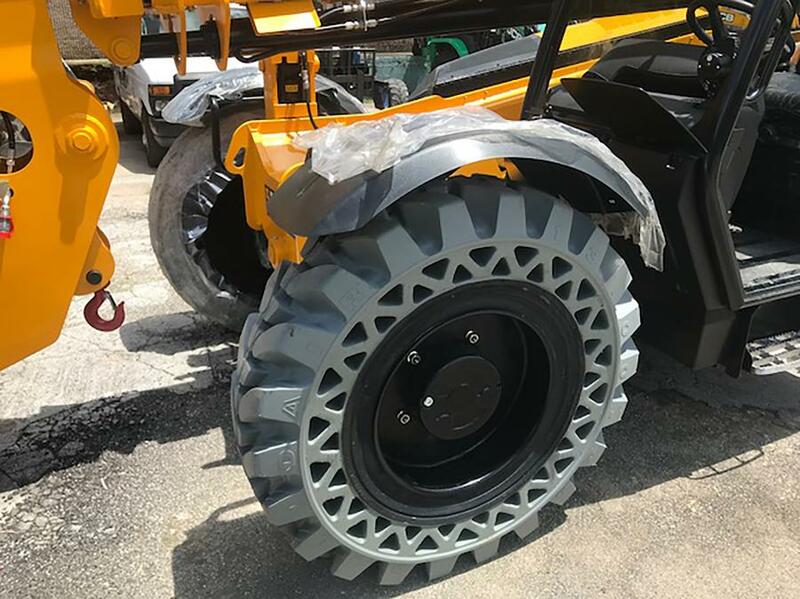 "Use of JCB telehandlers in the event and entertainment industries have created a lot of demand for non-marking tires," said Yates. "JCB is one of the only manufacturers to offer this option on large-capacity telehandlers." 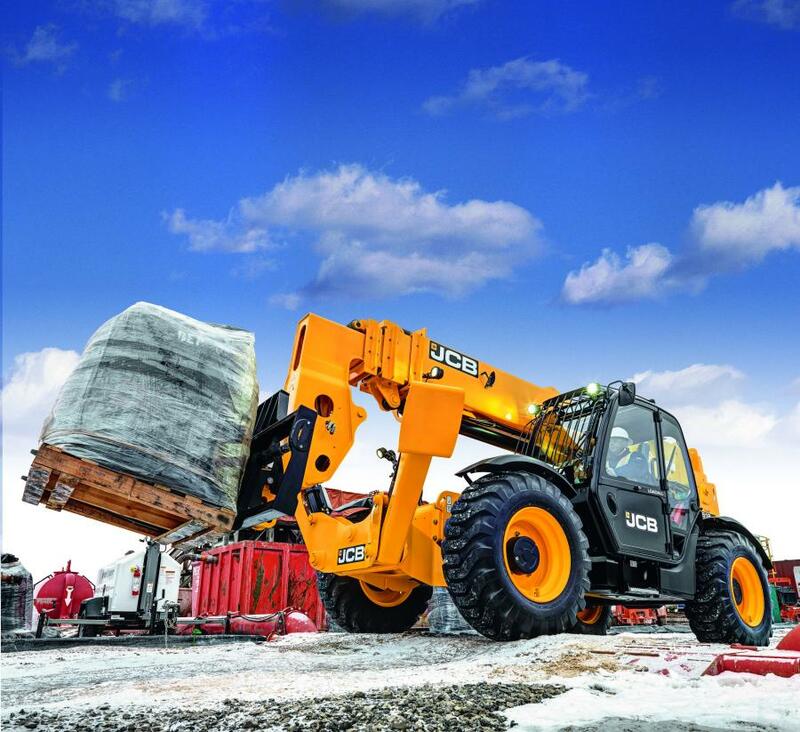 The JCB Arctic kit enables the telehandler to start and operate in temperatures as low as minus 40 F (minus 40C). The kit includes a hydraulic tank heater, cold-temperate electronic harness and hoses, battery heater, engine sump heater, storage cabinet and Arctic diesel. The Arctic package is a factory-fit option on 74 hp and 109 hp models.